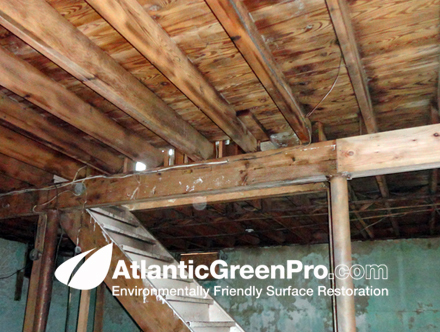 Our process safely removes burnt and charred surfaces from wood, cinder block, steel and concrete surfaces. 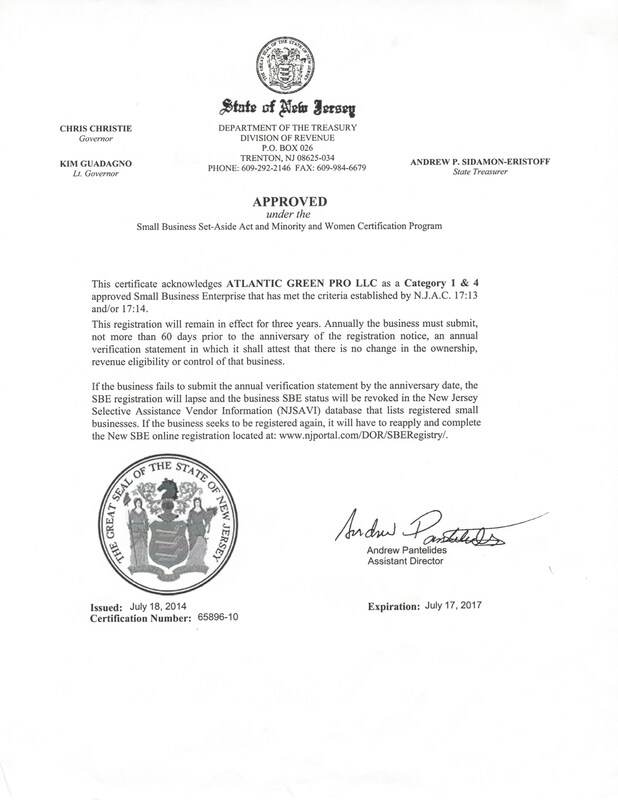 AtlanticGreenPro has solutions for just about any surface restoration project. 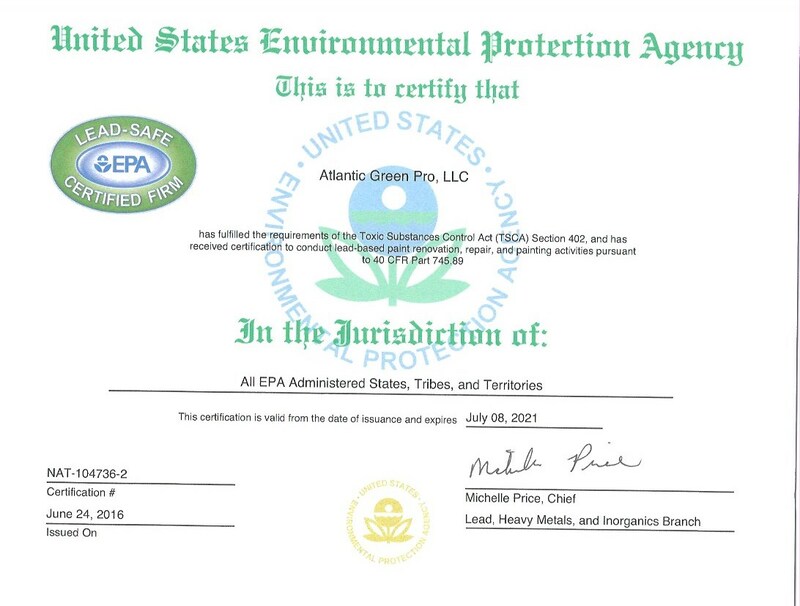 Our team of professional utilizes the best and safest processes to remove and clean just about any surface imaginable and we do it without damaging the environment with harmful airborne contaminates. 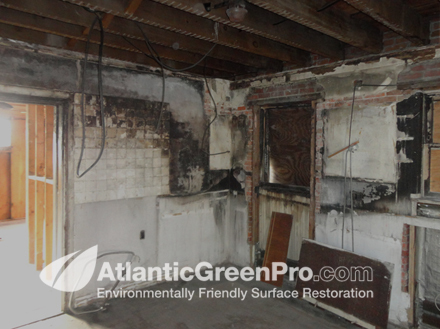 A big part of what Atlantic Green Pro does is both fire and mold restoration of surfaces. 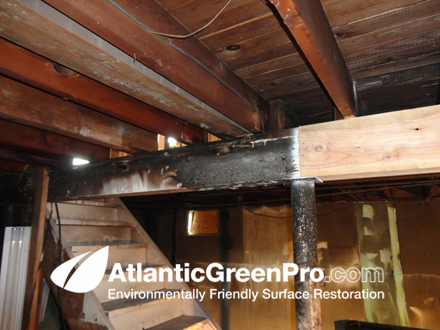 Below is a series of photos showing what we were able to do to the basement of this home which had a hot basement fire that both burned and coated the wood with soot. 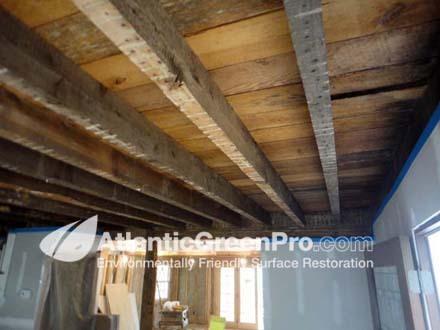 Interior ceiling where fire took place Here you can see where the contractor replacethe burnt wood beam and the wood that was burned which we were asked to restore. Same area as above photo where fire took place Here you can see where we blasted the burnt wood and removed the burnt surface. Again interior ceiling where fire took place Here you can see the burnt damaged wood. Same area as above photo where fire took place Here you can see where we blasted the burnt wood and removed all the burnt surfaces. 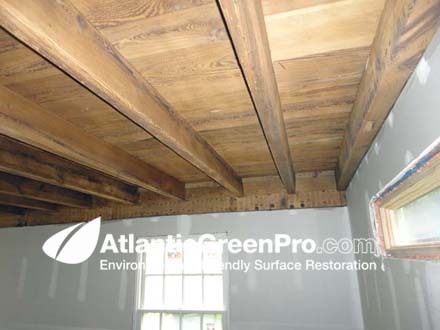 Again interior ceiling where fire took place Here you can see the burnt wood beam that we restored to like new condition and the wood we were tasked with restoring. 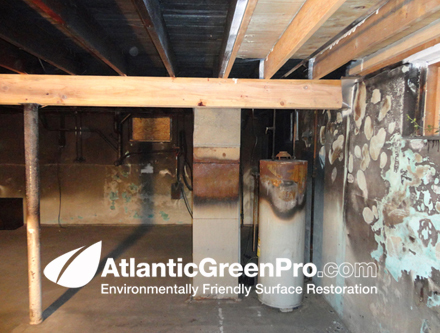 Same area as above photo Here you can see where we blasted the burnt wood and again removed all the burnt surfaces. 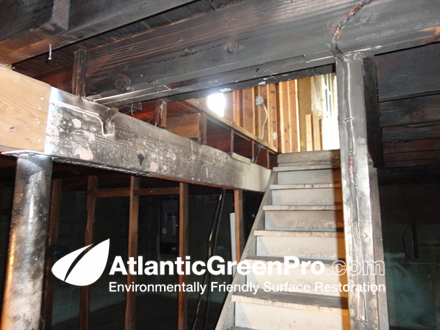 Again interior steps leading into basement where fire took place Here you can see the burnt wood beams that we restored to like new condition as well as all the other wood we restored and cleaned. 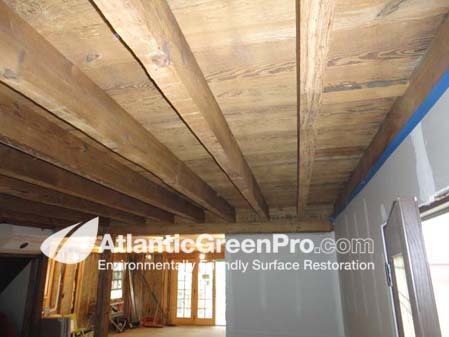 Same area as above photo Here you can again see where we blasted the burnt wood and again removed all the burnt surfaces. 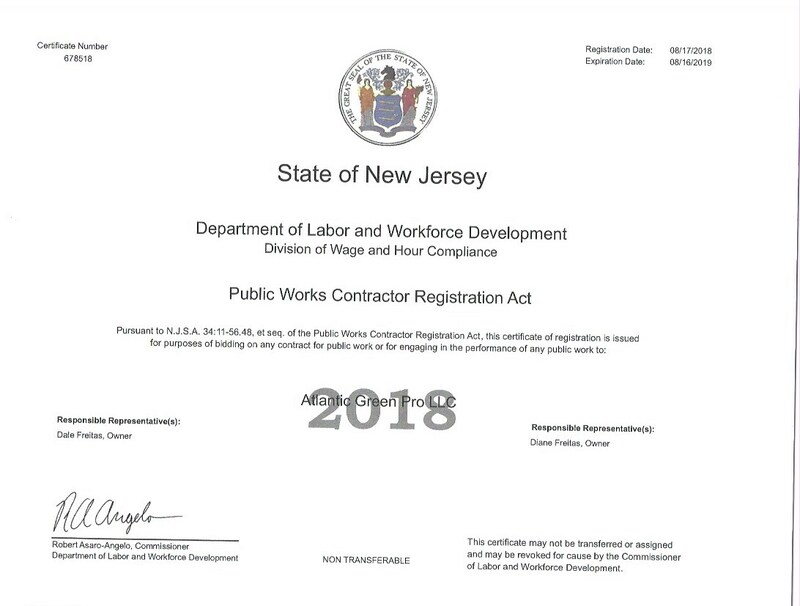 New Jersey Farmhouse Fire Soot and Mold Removal. 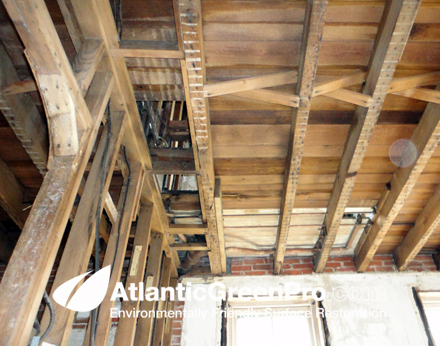 This was a project we did where the client asked us to strip the wood ceiling of fire soot and mold damage. 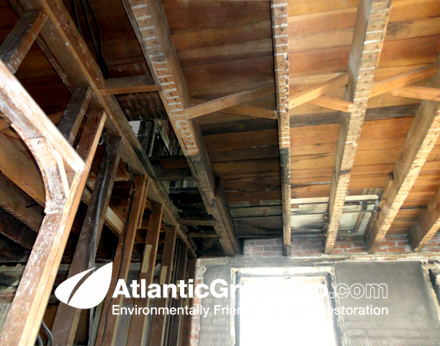 The house was undergoing a full renovation and years before there was a fire where the homeowner must have just build over the fire damage. 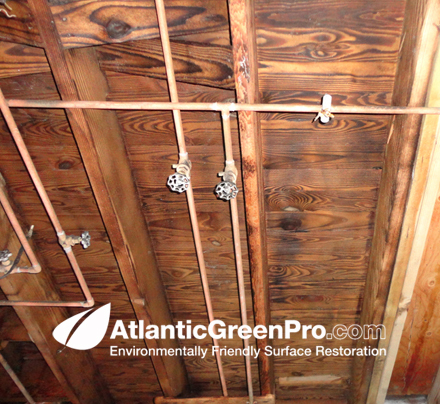 When the homes new owner demo-ed the interior he found the OLD fire damage. 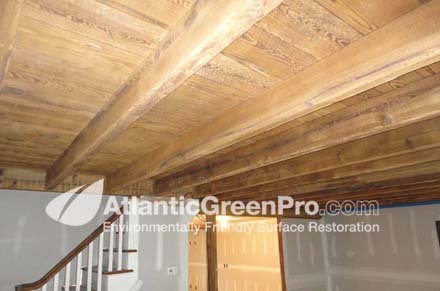 He also wanted to save the wood beam ceiling so we came in and walnut shell blasted it to bring it back to life. 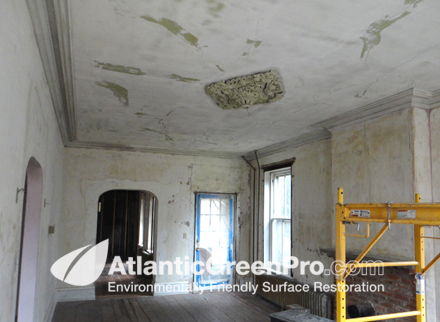 This was a project we did for a contractor who brought us in to remove the smoke and fire damaged wood, we were also tasked with removing the sood and fire damaged paint in the large plastered living room. 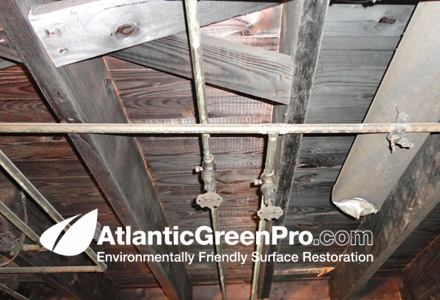 Atlantic Green Pro set up containment and blasted all traces of the fire away. 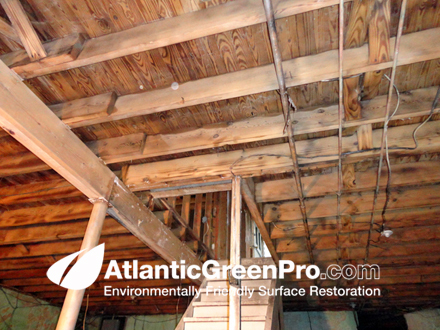 Same Interior area as above photo after blasting Here you can see the fire damaged area that we blasted, note how clean the wood beams are. This is the area outside the kitchen with smoke damage. 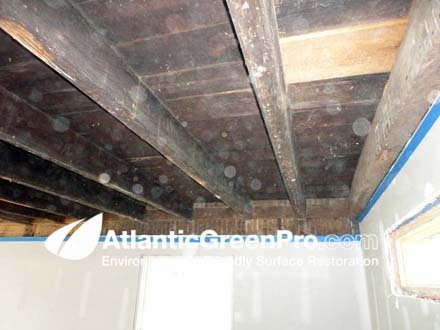 Here you can see the the smoke damage from the fire... the wood beam to the right were sealed off and not damaged by smoke or soot from the fire. 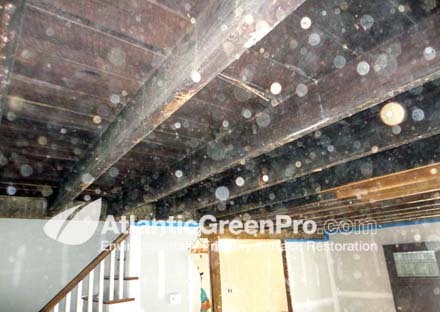 This is the same area as above photo Note how al the smoke and soot damged wood is now clean. This is the living room of the home which had major water and soot damage. 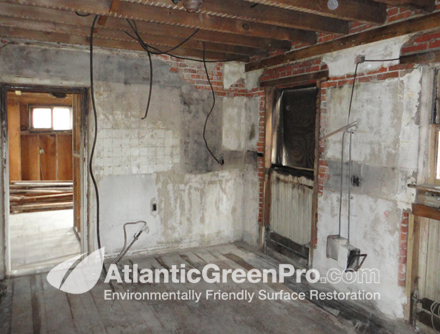 Atlantic Green Pro was asked to remove the old soot covered paint so that new plaster could be allied. 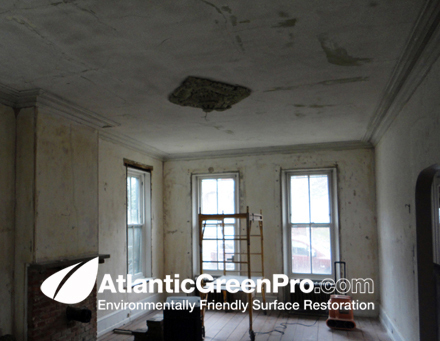 This is the same living room as the above photo Note how Atlantic Green Pro was able to remove all the old soot covered paint from the plaster with our green blasting process. 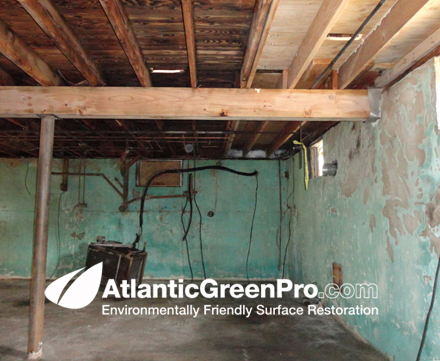 Again, same living room.... different angle with water and soot damage walls. 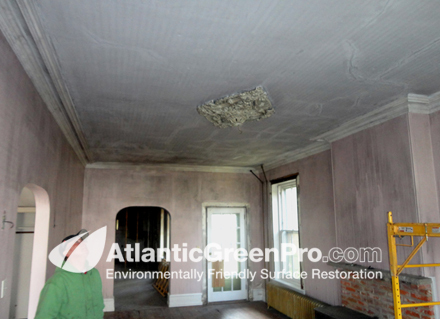 Atlantic Green Pro was asked to remove the old soot covered paint so that new plaster could be applied. 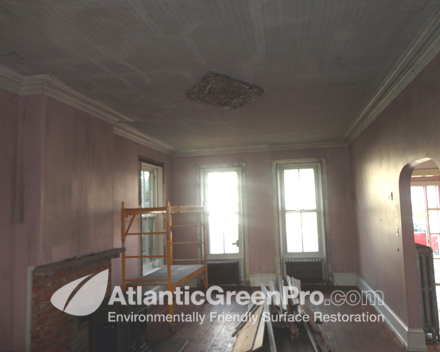 Again this is the same living room as the above photo Note how Atlantic Green Pro was able to remove all the old soot covered paint from the plaster.